Once again my favorite shop lured a little money out of my pocket with one of these surprising kits that seem to come out of the CIS region in an everlasting flow. Actually I bought it because it was cheap and I did not want to leave the store empty-handed. Upon close examination, I soon discovered how difficult it would be to assemble. Trying to match some of the larger parts, I immediately fell for this little plane: its speedy hull, its simple construction and its tiny dimensions. I had to build it right away. Getting information on this type proved to be more difficult than I had imagined. The Internet provides only bits and pieces. Few photographs of varying quality keep getting repeated from different sources. The authoritative monograph of the Sh-2 has not been written yet. This would theoretically be possible as at least one example remains airworthy today and has been shown at air shows in recent years. Built by V.B. 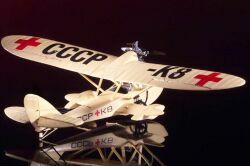 Shavrov during the early thirties, the little amphibian saw widespread use for a long period. Several seem to have been active as agricultural sprayers in the mid-Sixties. 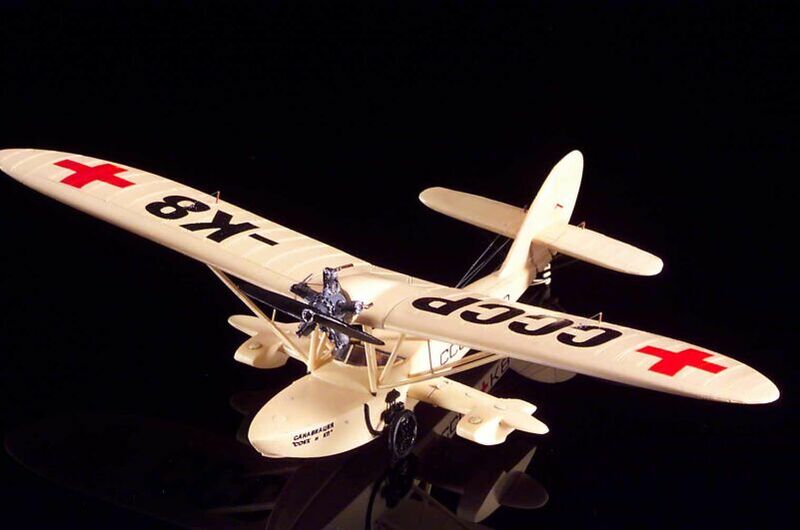 From the Pictures, it can be told that several details of the aircraft varied widely, depending on the era it was manufactured or operated. The kit of A-Model tried to enable the modeler to produce a wide variety of versions. Three different canopy configurations are provided with one of them fully enclosed. The decal sheet includes options for at least 5 models, three of these are being drawn in the instruction sheet. Markings for a VVS version are provided but there is no clue as how to apply them. Also included are the markings for the example captured by the Finns. Unfortunately the many variations of the subject make it more difficult to be completely accurate. The only engine/Propeller combination is represented as a partly enclosed radial with just the cylinders poking out and a streamlined spinner. Perhaps this arrangement was used for the same aircraft with the fully enclosed cockpit. In any case I was unable to find documentation to go by. 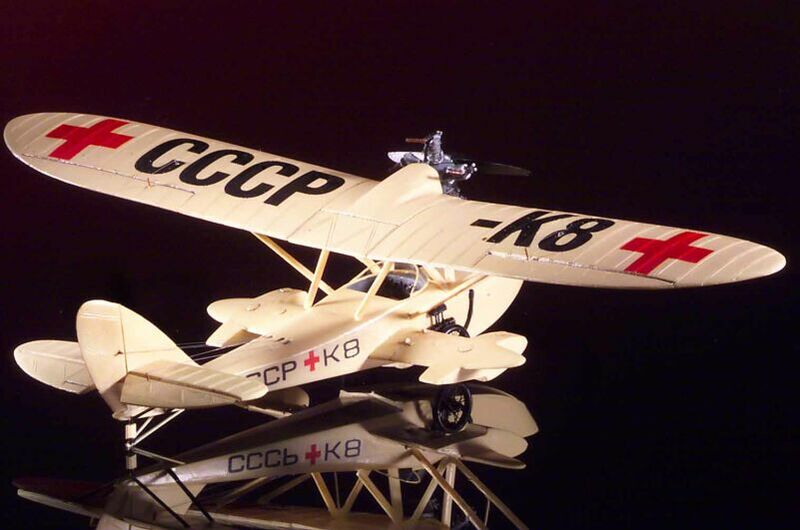 Most Shavrov's seem, for the better part of their life, to have been equipped with an open engine and a wooden propeller without spinner. This engine - the S-11 - is molded in a fantastic way by the Neomega brand. Their resin products are amongst the best in the World. The appropriate propeller can be cannibalized from any Po-2 kit. The engine of the kit could also be displayed uncovered by simply sanding down the nacelle and covering up the stump. But then the kit item is considerably undersize and the detailing is no match for the rival. This new label of models have to be commended for their brilliant choice of subjects (no Tomcat as yet). Precision of parts, however, is a problem to be worked on for future releases. The kit truly deserves the title: "For the experienced modeler". So please don't forget to provide a modest stock of putty and sandpaper as you purchase this little jewel. The good news is that the entire wing and tail plane are both well fitting and nicely detailed. The bad news is you have to assemble the fuselage too. 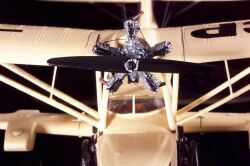 Forget the interior details and the finer parts of the undercarriage. They are best replaced or built from scratch. Luckily you will not have to make too much of an effort as the wing will cover up most of it and hide all missing details from view. Included in the kit is a stretcher that can be fitted to the plane instead of a second seat. But I wonder how in god's name did they load or unload a wounded patient in such a confined space. And if you were faking an illness, you certainly would need a doctor after this procedure. The plane must have been a lousy ambulance on dry land, not mentioning the possibility of a muddy beach. My guess is that it was best used to move doctors to the place of need. Also in need of replacing are the transparencies as they lack clarity. The very important struts are lacking in shape and have to be sanded to an acceptable standard. They are however rather precise in dimensions and guarantee the correct positioning of the wing. Use extreme caution when working with them. The plastic they are made out of is not as flexible as usual and they break easily. On most pictures, the Sh-2 is equipped with spoked wheels. 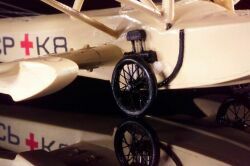 I cannibalized a set of photo etched wheels from an old kit of the Bleriot Monoplane that I found somewhere. The markings of my model were included in the decal sheet. They depict an example that was used during the war with Finland. There is a good quality picture of it. As far as I was able to check, the markings given by the instructions are incorrect in style and location to a high degree. In the case of K-8 there are noticeable differences between the decal sheet and the drawings in the instructions and the box art. Neither of them is entirely correct. The decals break up easily and are best applied fast using hot water. This is particularly important for the larger subjects. I compromised somewhat and sprayed all markings of the wing with the use of stencils but used the kit decals for the fuselage. If anyone is tempted to model the example of the Finish Air Force, he will have to modify the rudder, the engine nacelle and make another type of windscreen in addition to the details mentioned about engine and undercarriage already mentioned. I can not say whether these differences stem from the Soviet owners or the captors. So here it is. Don't hope for the quality you are used to when buying the latest ICM or Tamiya hardware. Don't look too hard for information since there isn't that much to be found. If you find any please don't tell me because I don't like to find out all my mistakes after I am finished. But if you want to enrich your collection with a tiny little object that attracts the eye as light attracts moth, then you have to go through it.